Atlanta is home to the world's busiest airport, averaging 275,000 passengers per day in 2018 in the sprawling single airport. 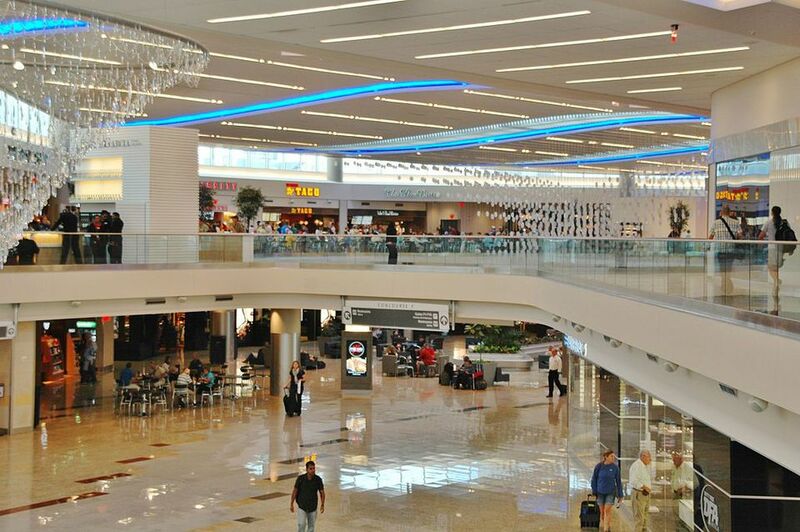 In the past few years, the airport has made great strides to upgrade the airport's dining options and bring in scaled-down versions of Atlanta favorite local restaurants, resulting in some of the best airport dining you'll find in the country. Whether you've got some time to kill or in a rush, this guide will help you find the best restaurants at Atlanta's Hartsfield-Jackson International Airport. For six years, Buckhead resident Jeff Varasano had a single mission: make the perfect pizza. He flew across the country, trying pizzas at legendary pizza parlors like Grimaldi's and Patsy's in New York. He finally found the perfect pizza and published the recipe on the Internet, turning him into an immediate Internet sensation and subsequently opened up his eponymous Buckhead restaurant. Though some prefer Antico Napoletano, some claim that Varasano's makes the best pizza in Atlanta and one of the best pizzas in the country. The airport version of Varasano's has a counter where you order your pizza and then they hand you a buzzer so you can pick up your pizza and eat it in the general food court area. They have a small piano bar, as well, with some good beer and wine selections. Cafe Intermezzo is one of Atlanta's favorite dessert and salad spots, modeled after a traditional European coffee house. The Atlanta airport Cafe Intermezzo is reminiscent of their swanky Midtown digs with dark wood paneling and small wooden tables and chairs. The menu includes a variety of tasty salads, crepes, and European-inspired entrees. Don't forget to save room for one of their decadent cakes on display at the cafe. Concourse C has, unfortunately, the worst of the airport dining options. If you have a few hours between flights, head over to one of the other terminals on the train. If you need a quick bite, your best bet is The Varsity, which serves up chili burgers, peach pies, and orange drinks with the usual "What'll ya have?" that has made the downtown location famous. But, the food generally isn't as good at the airport location as at The Varsity downtown. Grindhouse Killer Burgers is owned by Alex Brounstein, who began selling burgers at the Sweet Auburn Curb Market, Atlanta's historic indoor market. The burger fame spread and, pretty soon, Brounstein opened up several other locations, including the original Sweet Auburn shop. One Flew South is the premier restaurant at the Atlanta airport and touted as one of the best airport restaurants in the country. Cocktails are innovative, with options like a basil julep or a thyme and tequila concoction cheekily named "Arrival Thyme." Food standouts are the fresh sushi, pulled duck sandwiches, pork belly sliders, and banana pudding with hazelnut crunch. Prices are high but service and food quality are exceptional. You've hit foodie heaven when you head to the International Terminal and Concourse F. Pretty much all of the choices are spectacular but your best bet is Ecco. Ecco, located in Midtown Atlanta, is well known for its creative and delicious Mediterranean Italian fare. The beautiful airport location in the new international terminal includes both an internal restaurant area in muted leather and dark wood staining and a bright and cheery "patio" that looks onto the new international terminal. Food highlights include the pizzas and anything featuring the housemade ricotta. Again, as with Concourse C, Concourse T lacks in good restaurant choices and, if you have the time, go to one of the other terminals. Otherwise, your options are limited to the typical fast food options and TGI Friday's is the only sit-down option in this terminal. If you have three hours and don't feel like making the trek to Midtown or Downtown, you can take an easy 5-minute cab ride to Urban Foodie Feed Store, in College Park, Georgia, located in (unsurprisingly) a feed store. The restaurant puts out creative Southern dishes, including pickle brined fried chicken sandwiches and goat cheese stuffed fried green tomatoes.